In celebration of the 2nd 2018 World Migratory Bird Day, an Information, Education and Communication (IEC) campaign on Migratory Birds and its Conservation along with the “No Trulse Rule” and Trivia games were conducted on 12 October 2018 at the Lopez National Comprehensive High School (LNCHS) located in Barangay Magsaysay, Lopez, Quezon. Prior to the IEC activity, interested students were asked to participate in poem, slogan, cartoon comic strips, and handy bird craft (key chain) making during their English and TLE classes facilitated by their respective subject teachers and advisers. The IEC were participated by a total of 228 LNCHS students (90 males and 138 females) while other activities to determine students’ voices on birds and bird conservation like poem writing were participated by 16 students, slogan making by 23 students, cartoon comic strip by 10 students, and handy bird craft (key chain) making by 13 students. Six (6) chosen outputs per activities were awarded with certificate of recognition in appreciation of the students’ participation in the activities. Republic Act 9147 protects wildlife (birds) from being captured and caged as pets but there are still students who admitted their passion for caging birds like crested myna, coleto, and other birds as pets. Hence, to instil in the minds of everyone, elicit creativity, and promote alternative bird pets which could be with them everywhere they want to be with it, handy bird craft (key chain) making was done. 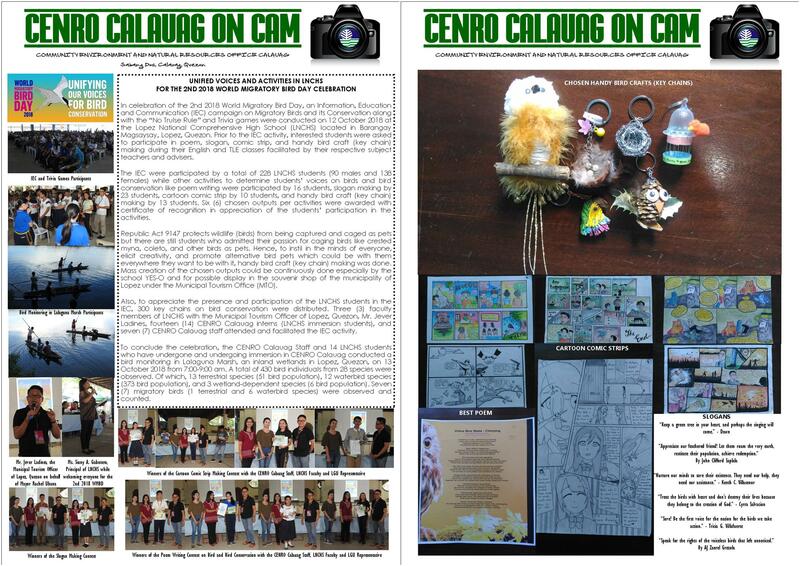 Mass creation of the chosen outputs could be continuously done especially by the school YES-O and for possible display in the souvenir shop of the municipality of Lopez under the Municipal Tourism Office (MTO). Also, to appreciate the presence and participation of the LNCHS students in the IEC, 300 key chains on bird conservation were distributed. Three (3) faculty members of LNCHS with the Municipal Tourism Officer of Lopez, Quezon, Mr. Jever Ladines, fourteen (14) CENRO Calauag interns (LNCHS immersion students), and seven (7) CENRO Calauag staff attended and facilitated the IEC activity. To conclude the celebration, the CENRO Calauag Staff and 14 LNCHS students who have undergone and undergoing immersion in CENRO Calauag conducted a bird monitoring in Lalaguna Marsh, an inland wetland in Lopez, Quezon, on 13 October 2018 from 7:00-9:00 am. A total of 430 bird individuals from 28 species were observed. Of which, 13 terrestrial species (51 bird population), 12 waterbird species (373 bird population), and 3 wetland-dependent species (6 bird population). Seven (7) migratory birds (1 terrestrial and 6 waterbird species) were observed and counted.